Former Rep. Claudia Tenney, who represented New York’s 22nd Congressional District in the 115th Congress, spoke to The Daily Signal at the Conservative Political Action Conference last week. Tenney narrowly lost re-election to Rep. Anthony Brindisi, D-N.Y., last November. An edited transcript of the interview is below. Rob Bluey: Looking back on your time in Congress with President Donald Trump in the White House, what stands out most to you? Claudia Tenney: History will prove the 115th Congress was one of the most successful Congresses in many decades. The president drove through a very strong agenda, and we delivered on nearly all of the Trump agenda except for a few items. In the House, sadly, we couldn’t get all those things through the Senate, but I think it was very successful when you look at tax reform. I was the only freshman member of the House Financial Services Committee to have two of my bills added to the Senate’s partial repeal of Dodd-Frank, protecting our community institutions, community banks, community credit unions, small institutions, and small businesses. A number of initiatives—whether it was on opioid funding, protecting our small business community, the tax cuts—there’s so many things that we did for the 22nd District. We secured record funding for the Air Force Research Lab [in Rome, New York], which is a really important institution, including a $14 million allocation for the perimeter fence that was mandated by the secretary of the Air Force 10 years ago. It was a very successful year. Unfortunately, we couldn’t outmatch my opponent’s super PACs. We did pretty well with fundraising, but they had a lot of money, a lot of resources, and they had the energy. The socialists were out in full force, even in our community. Unfortunately, a lot of people weren’t paying attention. I got more votes in 2016 than my opponent got in 2018. We had a harder time with turnout. And I think Republicans should be looking at 2020 as a dire wake-up call as to what they let happen in 2018 and how we lost the House and who is taking over. Bluey: You mentioned some of the accomplishments. What stands out in your mind during your service in Congress that you’re most proud of? Tenney: Tax reform in my district was really important. It helped our small business community. They produce almost 70 percent of the new jobs or more, especially in our area. I visited over 100 businesses, heard from many more, did numerous business roundtables, and the No. 1 thing they were praising was the tax reform. Our citizens have been victims of Albany’s tax-and-spend regime. That’s really chased record numbers of people and businesses out of New York, especially in New York’s 22nd District. Some of the most dramatic declines are in the Utica, Rome, and Binghamton area, and everything in between. We did provide funding to restore some of that, but standing up for our defense installations, like Rome Lab, was really important. Bluey: Last year was the first time a U.S. president visited the Utica area in decades. Tenney: It was the first time a sitting U.S. president has been to Utica, New York, since 1948, so it was 70 years. In 1952, my grandfather, Robert Roberts, brought candidate Dwight Eisenhower to Hamilton, New York. He was a candidate for president. Did you know that 75 percent of the students polled at the time supported Eisenhower at Colgate University. I would say that would probably be 5 percent today, but I thought it was just interesting. I found the article in our family newspaper, which my grandfather founded in 1946, and it was interesting to see the column and how things have changed. Bluey: What was it about your own life that inspired you to run for Congress and seek public office? Certainly it’s not always glamorous and a lot of hard work goes into it. Tenney: It’s not glamorous. A lot of people think it is. There’s a lot of myths out there about Congress and what people get. It’s a privilege and an honor to serve our country, also to represent the 22nd District in our capital and be able to fight for what we have been through. Our region in New York is where the Industrial Revolution started along the Erie Canal, and the first shovel was put in the ground in Rome, New York. As a small business owner, this is important to me. Paul Revere started his business here, Remington Arms was started here, IBM was founded in my district—all kinds of small businesses that rose to really worldwide acclaim and worldwide recognition. But the entrepreneurial spirit of our region needed to be revived, and I’m a small business owner—my business was started by my grandfather. First we had a newspaper and printing operation; now we specialize in pharmaceutical packaging. I could see it on a day-to-day basis most of my customers on the newspaper side were small business owners and they were getting hurt by crushing regulations, high taxes, and just really not having a chance to compete with the national chains or the big box stores and the big companies who were getting all these subsidies, and all these benefits from government. You’re seeing a lot of this playing out in New York today with billions of dollars being spent by Andrew Cuomo to lure these big companies, and it’s now one of the worst places to do business in the nation, one of the worst economies in the nation. From my experience in the New York State Assembly, I thought that as a minority member it would be an opportunity to jump onboard and go to Congress and try to help our small business community. I’ve always maintained a 100 rating from the National Federation of Independent Business, and I’ve been a member for almost 30 years. They’ve been tremendous advocates to help the small businesses, which is really the heart of America. This is how our country was made great—it’s because of entrepreneurship, small businesses, freedom, and the ability to really create a life for yourself and create a product and a service, and also help your community. And that’s what I saw as my opportunity in Congress. Bluey: You mention some of the economic challenges that New York faces, and of course with all-Democrat rule, they’re not the policies the conservatives like to see implemented. One of the things that has caught the nation’s attention is the abortion law that Gov. Cuomo signed. We’ve seen significant shifts in public opinion since that happened, particularly among people under the age of 45 and those of who are Democrats. There was a 17-point swing overall in people who are now saying they are now pro-life. What does this mean and do you think those shifts in public opinion are a result of the left’s overreach? Tenney: That’s part of it. In New York City, all these things that we’re seeing coming out of the famous [Rep.] Alexandria Ocasio-Cortez and the things that she stands for, they have been battered around in the New York State Assembly, they’ve been voted on numerous times. Socialism has been going on for a long time in New York and it’s very dangerous. Gov. Cuomo unwittingly brought all of this to the forefront and now people are starting to realize just how dangerous this socialist agenda really is. People have been moving more and more toward the pro-life stance because of science and because they’re starting to realize the moral nature of it and how important it is to be pro-life. 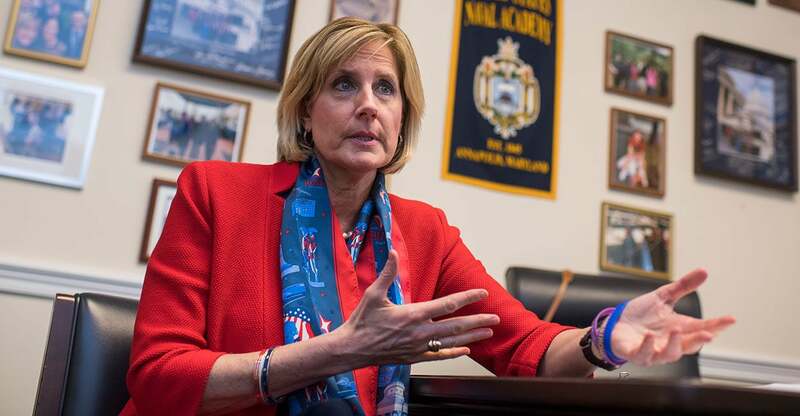 Bluey: So what does the future hold for Claudia Tenney? Tenney: I have a lot of opportunities. I’ve served in public office for eight years. I’m obviously disappointed to lose because I feel like we just had an amazing two years, and I wish we could have made that more clear to the voters. I’m not ruling out the possibility of running again. I’m looking at every option. There are a lot of options out there. Whatever I do, I’m going to always advocate for my community and always advocate for our nation. It’s so important to preserve our constitutional republic, and make sure people understand that we need to preserve it. Whatever I can do to help in the cause, that’s what I’m going to continue to do.